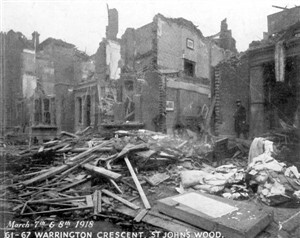 During the course of the thirty or so air raids on London between May 1915 and May 1918, the worst incident of those killed and injured by a single bomb took place in the City of Westminster on the night of 28th/29th January, 1918 when a 300kg high explosive bomb fell on the Odhams Printing Works in Covent Garden. Of the fifteen aircraft which had taken off from Belgium only four made it through to the London area – three Gotha twin-engine bombers and one R.VI four-engine “Giant” bomber – but although small in number, this force was destructive enough for many in the City of Westminster to take shelter where they could. 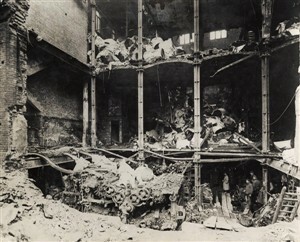 One seemingly impregnable refuge used by staff and the public during air raids was the basement of the Odhams Printing Works which was part of a strongly-constructed four-storey concrete building on Long Acre and it was over this area that the R.VI “Giant” dropped its 300kg bomb in the early hours of 29th January. This fell short of the building but smashed through the pavement in front of it and into the basement where it exploded wrecking printing presses and igniting the large stock of newsprint stored there. Many taking shelter in the basement tried to flee, desperately, but as only one of the two exits to the street was not blocked by the blast, this proved extremely difficult. The amount of debris was so great that it took several weeks to search through all the rubble for bodies but when the final toll of casualties was taken, thirty-eight people had been killed and eighty-five injured. Many of these were women and children including a mother who lost all the fingers of one hand and a leg as well as her baby. This page was added by Adrian Autton on 17/05/2014.